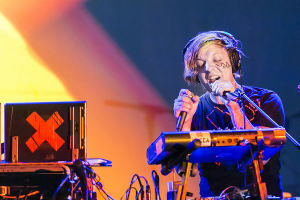 Robert DeLong came into Chicago for a late night show at Lincoln Hall. Despite it being a Monday, and the show starting at 11pm, a nice sized crowd came out to catch one of the most talented electronic artists around, for a short, but wonderful set. DeLong might not be as well known as other names in the electronic scene, but his live show is not to be missed. The show featured no opening act, so DeLong hit the stage promptly at 11. A unique artist, DeLong performs the entire show by himself. His setup features all sorts of computers, percussion and various triggers. Which is exactly why DeLong is the type of artist every electronic fan needs to witness. With electronic music becoming the default pop music of this era, many people simply see a DJ on stage, behind a console, and that’s it. DeLong works for it. Jumping from different synths, triggers and a drum set, his set is full of surprises, with a level of musicianship not found in various nightclubs. With only an album and an EP out, DeLong didn’t have the largest collection of songs to play, but he did manage to fill up the hour slot effectively. He played a variety of tracks off of his debut Just Movement, including “Happy,” “Basically, I,” and the smash “Global Concepts.” He also played “Long Way Down” off of his recently released Long Way Down EP. Spirited covers of “Miss You” (Rolling Stones) and “Take My Picture” (Filter) were given the DeLong treatment, impressing myself and the rest of the crowd that caught on. The music was great, creating a dance floor atmosphere that I haven’t seen in a while. The visuals were stunning, with pre-recorded video sections syncing up with the music, while a live camera feed from the console showed exactly what DeLong was doing. And finally, the musicianship was something to take note of. The rap on electronic music is that the DJ’s and artists simply use prerecorded tracks to sell out festivals. DeLong proves that there’s all sorts of work that goes into it, and more DJ’s should take a page out of his book when it comes to live performance.